I have two points to make about Pope Francis and seven points to make about the encyclical Laudato Si. 1. Francis makes no pretence to being a theologian in the same class as his predecessor Pope Benedict XVI. He has such humility that he would not even claim to hold a candle to John Paul II. He is not on about changing dogma or church teaching. He rightly thinks that we have had our fill of the teachings laid down from Rome; we just need a bit more old fashioned pastoral solicitude. 2. Francis is all about dialogue. The self-described Bishop of Rome exercises his primacy so as to effect dialogue amongst all sorts of people with all sorts of diverse experience and competencies. That's what last month's synod was all about — making the space for dialogue. That's what this encyclical is about — enhancing the prospects for constructive dialogue especially when world leaders gather shortly in Paris to discuss climate change. Laudato Si is a committee job which could have done with some better editors. But it is the fruit of extraordinary collaboration. Seventeen bishops' conferences are quoted. Subsidiarity is not only espoused; it is enacted in the drafting process. Scientists, economists and political scientists all had a place at the table. The basic structure of the document is: Chapter 1: what's the problem; Chapter 2: what's scripture and the tradition got to say about it; Chapter 3: how did the problem arise; Chapter 4: what are the principles for addressing the problem; Chapter 5: what can we do about it; Chapter 6: how can we develop our own interior disposition for change. He's not pretending to hand down the answers from on high. He is inviting us all to participate in a dialogue. Contrary to much of the public carry-on, the encyclical does not give answers to big scientific, economic or political questions. Francis insists that such answers are beyond his competence and beyond the competence of the Church. He does not pretend to have answers to the big questions which will confront world leaders when they gather in Paris. But he does think the science is IN, and the evidence is clear that much of the climate change, loss of biodiversity and water shortages are the result of human action. He thinks we have been over-reliant on technology to find the answers without our needing to amend our behaviour, and over-simplistic in our naïve hope that material progress will continue. Beyond this, he does not claim to have the answers or even the key directions in which we need to move. Where Francis starts to get into trouble with some from the west or from the north (depending on your geopolitical perspective) is in his questioning the myth of unlimited progress. He says, 'If we acknowledge the value and the fragility of nature and, at the same time, our God-given abilities, we can finally leave behind the modern myth of unlimited material progress. A fragile world, entrusted by God to human care, challenges us to devise intelligent ways of directing, developing and limiting our power.' (#78) He boldly asserts, 'Never has humanity had such power over itself, yet nothing ensures that it will be used wisely, particularly when we consider how it is currently being used.' (#104) He is clearly at odds with those who assert that the key to the future is simply growing the pie so the poor can get more while the rich need not get less than what they already have, and that growing the pie is as good a way as any ultimately to save the planet. Francis doesn't buy this status quo position. He thinks there is a need to limit the size of the pie, for the good of the planet, and there is a need to redistribute the pie so that the poor get their equitable share. Hailing from Argentina, Francis puts his trust neither in ideological Communism nor in unbridled capitalism. Like his predecessors Benedict and John Paul II he is unapologetic asserting, '[B]y itself the market cannot guarantee integral human development and social inclusion. '(#109) He has not known a regulated market that works well. He has not known a polity in which all including the rulers are under the rule of law. He questions any economic or political proposal from the perspective of the poor, and he is naturally suspicious of any economic or political solution which is likely to disadvantage the poor. What for him may be a failure of the market might be seen by some of us who are used to well regulated markets in societies subject to the rule of law as a failure caused by market abuses which might be readily corrected by the application of right economic and political strategies. Nationally and internationally, we need improved political engagement by our leaders who have a concern for the wellbeing of the planet and the wellbeing of all persons, including the poor. We need to get beyond short term political cycles in which elected leaders are simply populists serving sectional interests which guarantee their election. He says, 'What is needed is a politics which is far-sighted and capable of a new, integral and interdisciplinary approach to handling the different aspects of the crisis.' (#197) He sees a need for the politicians and economists to enter into dialogue for the good of all of us: 'Politics and the economy tend to blame each other when it comes to poverty and environmental degradation. It is to be hoped that they can acknowledge their own mistakes and find forms of interaction directed to the common good.' (#198) Like his predecessors in the papacy, he probably has a very idealistic hope in the UN or its successor noting, '[T]here is urgent need of a true world political authority.' (#175) He knows that the real crunch will come in Paris with world leaders trying to work out what is equitable and workable in distributing the costs for carbon consumption amongst nations which include those now wealthy because of past pollution and those now seeking to develop and lift the poor from their misery with energy efficient development. One big difference at Paris over Copenhagen will be that the Chinese will no longer be asserting that cheap polluting energy is the key to releasing 1 billion people from the clutches of poverty. They are choking in their own smog in their large cities. They know there has to be a better way. This is the wisdom of someone who cannot be parodied as an anti-capitalist greenie. We are blessed to have a pope who speaks to all the world about the prudence, justice and empathy required so that more people on our planet might enjoy integral human development. He invites us to live the ecological vocation of justice — in the footsteps of Francis of Assisi, and being prepared to engage with all comers anxious about the future of the planet and the plight of the poor. Fr Frank Brennan SJ, speaking at North Sydney and Mosman Parishes, 4 November 2015. 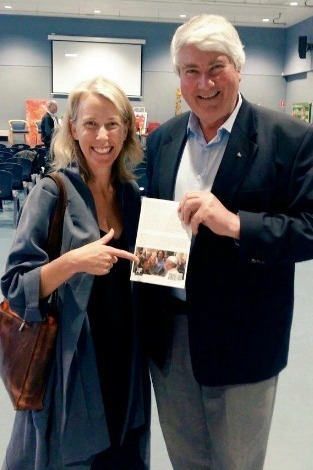 Post script: It was a delight to to speak about Laudato Si on the same platform with Jacqui Rémond [pictured with Fr Brennan], Director of Catholic Earthcare Australia. She features on the back cover of my new book The People's Quest for Leadership in Church and State, meeting the Pope together with Tomas Insua, global coordinator of the Global Catholic Climate Movement and Allen Ottano, coordinator of the South African Catholic Environmental Youth Network. Rboert Manne lauded this document with particular recognition. Rather little acknowldegment however on the P word? Population. P word ?